Squish it! Mould it! Love it! Never dries out, easily cleans up and it sticks to itself, not to you! Kinetic Sand is the squeezable sand you can’t put down! It sticks to itself and not to you! It flows through your fingers like magic, leaving them completely dry. Kinetic Sand stimulates children’s creative skills, allowing them to create anything they can imagine over and over again. 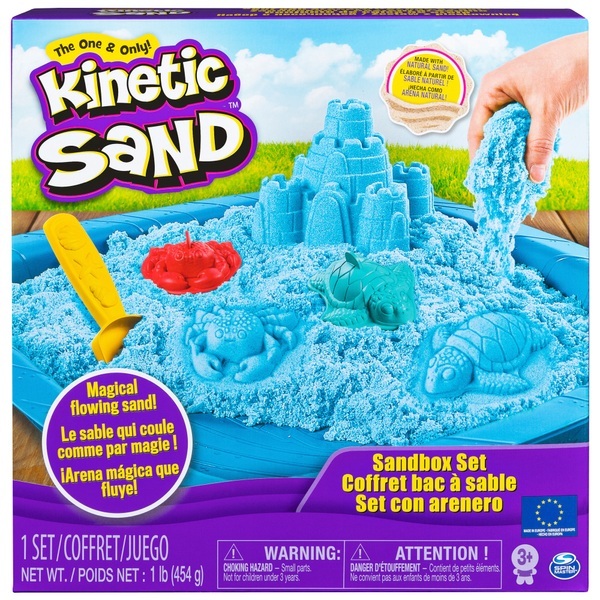 The Kinetic Sand Sandcastle set comes with 1lb of sand, 3 moulds, a beach tool, and a sand tray to play in the creative possibilities are endless! Kinetic Sand never dries out, and this soft sand is easy to clean up. Styles may vary.